Documentation of one of the encounters set up by Eric Anglès as a part of Special Actions in Varied Parking Lots in Variable Time. 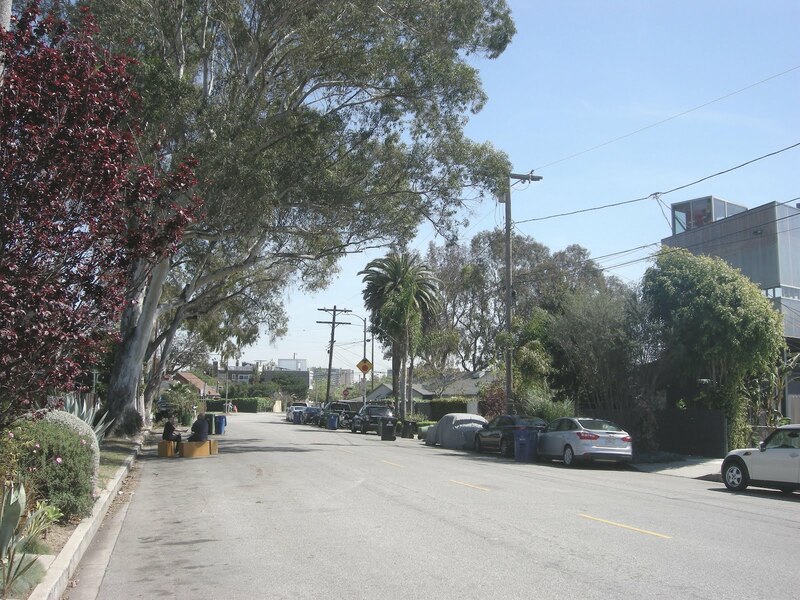 Placed on a street in Venice, CA, this piece was set up on the side of the street unoccupied by parked cars due to street cleaning. 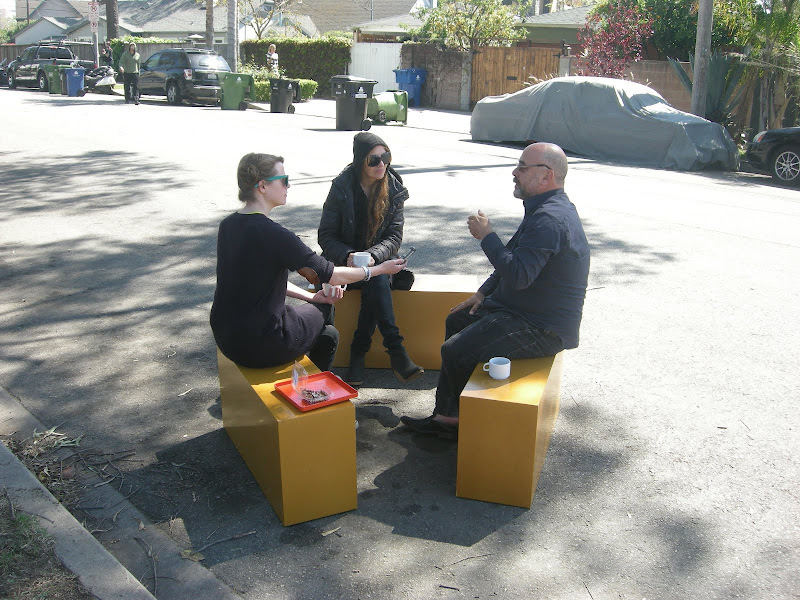 Three benches placed in various public parking spots caused three-way conversations to ensue on the following topic: What is public space? These conversations were recorded, transcribed, anonymized, lightly edited for fluency and printed as separate booklets. As with all of the artist’s work, the booklets will be available as unlimited editions. Every participant received at least one booklet. Participants were passers-by as well as anyone who wished to schedule an appointment. 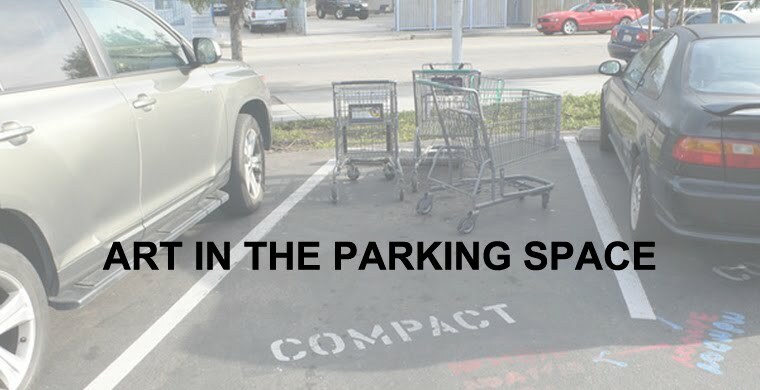 Please join us for the final installment of Special Actions in Varied Parking Lots in Variable Time tomorrow at 8 pm in the REDCAT Parking Structure. Norwegian artist Tori Wrånes will be orchestrating SPIN ECHO, a moving sound sculpture in the form of a choir on bicycles. ART IN THE PARKING SPACE IS A YEAR-LONG PROJECT BY WARREN NEIDICH AND ELENA BAJO AND IS PRESENTED BY LA><ART. 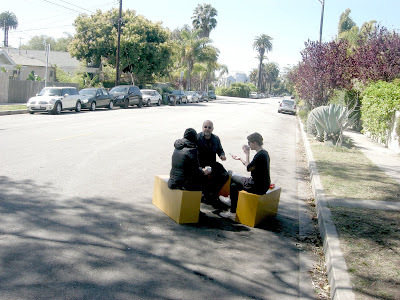 FROM JUNE 30, 2011 TO JUNE 30, 2012, INVITED ARTISTS WILL CREATE TEMPORARY AND EPHEMERAL ARTWORKS IN PARKING SPACES ACROSS LOS ANGELES. EACH WORK WILL REFLECT DIFFERENT ENVIRONMENTS AND SETS OF CULTURAL PERAMETERS THAT DEFINE THE LOS ANGELES BASIN. PUBLIC AND PRIVATE SPACES WILL BE OCCUPIED, FROM A LARGE PARKING LOT TO A COLLECTOR'S DRIVEWAY. Warren Neidich is a conceptual artist and writer who lives and works between Los Angeles and Berlin. His research based artworks combine strategies of performance, installation, and teaching in search of a new language with which to explore and critique the evolving conditions of Cognitive Capitalism which he sees as a threat to free will. Elena Bajo is a Spanish artist living and working in Los Angeles and Berlin. Her concept-generated and research based practice is concerned with the social and political dimensions of everyday spaces, the strategies to conceptualize resistance, the poetics of ideologies, and the relationship between temporalities and subjectivities. She works individually and collectively across performance, sculpture, painting, participatory events, film, text and writing. Founded in 2005, LA><ART is the leading independent non-profit contemporary art space in Los Angeles, committed to the production of experimental exhibitions and public art initiatives. Responding to Los Angeles’ cultural climate, LA><ART produces and presents new work for all audiences and offers the public access to the next generation of artists and curators. LA><ART supports challenging work, reflecting the diversity of the city and stimulates conversations on contemporary art in Los Angeles, fostering dynamic relationships between art, artists, and their audiences. LA><ART has produced and commissioned over 100 projects in its first five years.